The return journey to N’Djamena is all about the animals. We see three types of monkey, camels, new born donkeys, horses and goats and even a deer. Of course each time I tried to take a photo, the animals disappeared. The return journey to N’Djamena is all about the animals. We see three types of monkey, camels, new born donkeys, horses and goats and even a deer. Of course each time I tried to take a photo, the animals disappeared. The lakes are beautiful, different shades of pink and green, covered in lilies or flocks of birds. And there are huge hills made of striped boulders. Even the people look stunning against this backdrop, particularly the women with their layers of bright bold colours. We see a baby goat (what are baby goats called?). It’s limping. Slow and helpless. Its vulnerability transports me back to the intensive care unit at Am Timan hospital, full of children with malaria, all of them so weak and frail, each with a concerned mother at their bedside, willing them to get better. There’s a little girl with severe anaemia, her breathing rapid, linked to a tube supplying blood. Malaria is a parasite that has part of its life cycle in the blood. This is the stage that causes the clinical symptoms of malaria. Parasites multiply rapidly in red blood cells and burst out, killing the cell and each infecting a new red blood cell, multiplying again. This huge loss in red blood cells can lead to anaemia, often severe in young children. And unlike many countries in the West, hospitals struggle to maintain a blood bank. We often have to ask family and close relatives to donate, to save the life of the child. Another child lies in a coma. Her skinny body unable to cope with the overwhelming disease. The worry is etched on her mother’s face. It feels wrong to take a photo but all the mothers want me to take photos of their children so that people will know what’s happening. But luckily many of these children will get better with effective clinical management and intravenous artesunate. And the ward next door is proof, full of children on the road to recovery, screaming and eating and doing all the things kids should do (that’s what baby goats are called!). We just have to find them early enough. Which is why our additional mobile malaria clinics are so important. In addition to supporting the Ministry of Health Clinics, MSF is currently running its own malnutrition and malaria clinics in areas that do not have a health centre. We are detecting large numbers of malaria cases and treating early with artemisinin combination therapy (ACT) to prevent them becoming severe. But for the severe cases, we are transporting them to Am Timan hospital either in our own vehicles or fuelling MoH ambulances to transport them, saving precious time. 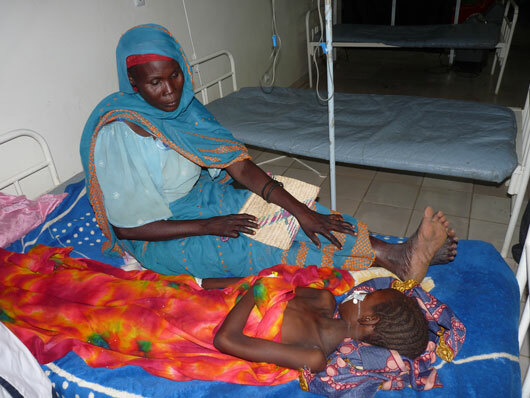 But additionally the Ministry of Health and MSF treat these severe cases with pre-referral rectal artesunate. Studies have shown that in situations where parenteral medication is not possible and travel to a hospital is expected to take more than six hours, using a single dose of rectal artesunate reduces the risk of death or permanent disability (as long as this initial treatment is followed up with appropriate parenteral antimalarial treatment in the hospital). And on top of this we have outreach (community health) workers visiting the communities, raising awareness about the symptoms of malaria and the availability of free treatment, monitoring deaths likely due to malaria and referring malaria cases to the clinics and hospital. It’s exhausting work, involving walking or cycling large distances, in tremendous heat or rain. But the outreach teams are hard-working and enthusiastic about their work, they realise how important it is right now. We are doing as much as we can in Am Timan but there is still so much to do. We are seeing an increasing proportion of malnourished children that are positive for malaria. Both conditions in the same child can be mutually exacerbating. We need to administer early ACT and a course of Plumpynut™, a peanut-based nutritional therapy that we have found to be highly effective in treating malnourished children. It’s great being surrounded by all these tiny children gobbling up Plumpynut. And it’s all about the kids.